Scope and Content View of Nos 5-7 Rumford, Crail, Fife Crail was created a royal burgh in 1310, with a royal castle just to the east of the burgh. Fishing was the main industry in the town throughout its history, but this declined during the 19th century, and the town now relies on tourism. 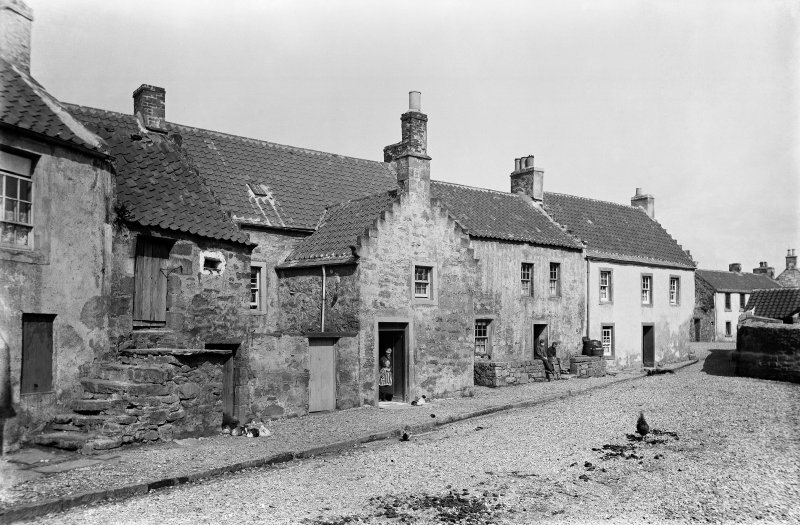 These 17th-/18th-century buildings in Rumford are typical Fife fishing cottages. Features common to the Fife coastal villages include the crowstepped gables, pantiled roofs, and the external stair leading to the first-floor entrance door. In 1961, Nos 5 and 6 Rumford were the first houses to be restored under The National Trust for Scotland's 'Little Houses Improvement Scheme'. This scheme has funded restoration work on many houses in Crail, and indeed, across Scotland. Source: RCAHMS contribution to SCRAN.